Inventory We are a resale marketplace, not a box office or venue. Ticket prices may exceed face value. This site is not owned by Altria Theater . The Altria Theater in Richmond, Virginia, United States is a theater at the southwest corner of Monroe Park. It is so named because it is "one of the best known buildings in Richmond." 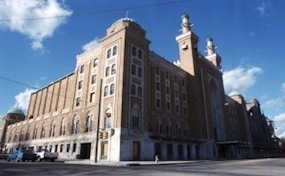 Formerly known as "The Mosque," and the Landmark Theater the Altria was constructed in 1926 to be used by the Shriners as the ACCA Temple Shrine. The city purchased the building in the 1940's and refurbished it between 1994 and 1995. It is currently a very popular venue, hosting a number of big-name musical and theatrical performers each year. The theater was designed in Moorish Revival style by Marcellus Wright, Sr. in association with Charles M. Robinson and Charles Custer Robinson in 1925 and completed in 1926. The Altria Theatre recently has hosted Book of Mormon, Lion King, and Beautiful. Altria Theatre underwent further renovations in 2013 which included: new restrooms, parlors on the third floor, new stage floor system, repainted and refinished handrails and stairs, new wiring on the third floor, and seat restoration. The theater is also home to a ballroom with a capacity of 1,00 and a seated capacity of 600. The ballroom has been the host of numerous fundraiser dinners for various organizations and presidential campaigns. Unknown to most, the venue hosts 42 hotel rooms, a gym, a pool, a three lane bowling alley, four lounges, and its own restaurant with street access. TheatreRichmond.com is not affiliated with any primary box office or supplier. We are a privately owned and operated business specializing in sales in the secondary market. To buy tickets for any Altria Theatre events in Richmond simply click on the event of interest or call our operators at anytime.